Marshawn Lynch sat out the entire first quarter of the Seahawks divisional clash against the Cardinals last night due to a stomach ailment, aka a tummy ache. He would enter the game in the second quarter, taking his 10 carries for 113 yards, two touchdowns and one 79-yard score, reminding us all why we call him Beast Mode. 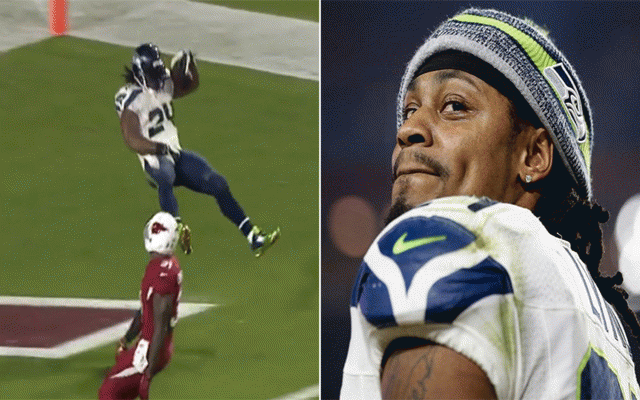 Not only did he shake off All-Pro cornerback Patrick Peterson, but he did the Madden celebration! Teammate Michael Bennett said it was the best touchdown score he’d ever seen. Of course, Marshawn had a similar run during the 2011 NFC Playoffs that’s hard to top. After the game, Marshawn was very gracious to reporters asking him questions. Lynch was fined $100,000 for refusing to talk to reporters after a game against the Chiefs earlier this season. Here’s a full transcript from his interview last night. He came a long way since answering interviews with just one-word answers. 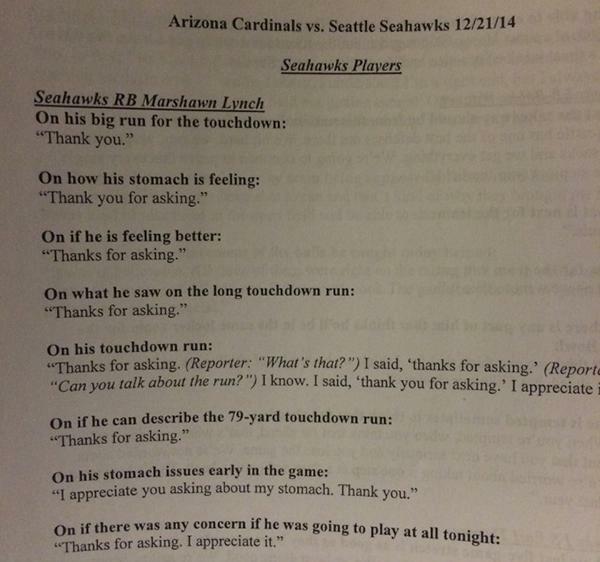 Marshawn is actually a very deep and complex individual. Check out the entire interview of Money Lynch opening up below.